As expected, Institutional Shareholder Services (“ISS”) published several supplemental documents in December that elaborate on the updates to its U.S. executive compensation benchmark policy guidelines for 2018. These documents include Frequently-Asked Questions (updated for both U.S. compensation policies and U.S. equity compensation plans) and a revised “White Paper” summarizing the mechanics of its “pay-for-performance” methodology for evaluating executive compensation programs and updated to reflect the introduction of ISS’ new Financial Performance Assessment test. At the same time, ISS also published its updated equity compensation burn rate tables for the 2018 proxy season. This Thoughtful Pay Alert summarizes the key ISS executive compensation-related policy updates for 2018. A summary of ISS’ benchmark policy changes for 2018 are available at the following link. With the exception of the new policy on non-employee director compensation, these updates will be effective for annual meetings of shareholders taking place on or after February 1, 2018 (although 2017 director compensation will be considered when identifying a pattern of “excessive” pay). As anticipated, ISS has added a new component – the Financial Performance Assessment (“FPA”) test – to the quantitative “screening” portion of its methodology for evaluating executive compensation programs for purposes of issuing a voting recommendation on a Say-on-Pay proposal. Based on the explanation contained in ISS’ revised “pay-for-performance” White Paper, for the 2018 proxy season the test will be used as a “secondary” measure that only comes into play after the three traditional quantitative tests (the Multiple of Median (“MOM”) test, the Relative Degree of Alignment (“RDA”) test, and the Pay-TSR Alignment (“TPA”) test) have been performed. The specific metrics for each company are selected and weighted based on industry. Most industries will use four metrics, but for a small number of industries, three will be used. Where the determination under the three traditional tests results in a “high” concern level (or a “low” concern level that is not bordering the “medium” threshold), the FPA test will not come into play. Observations. ISS has indicated that, for the first year of implementation, it expects the number of companies that will be potentially affected by the introduction of the FPA test to be limited (that is, less than 5% of all companies subject to the quantitative screen). Even if this proves to be the case, the change to the methodology is likely to be viewed skeptically by most companies. Since the overall concern level is the indicator of the possible presence of a “pay-for-performance” disconnect, it determines the degree of scrutiny that ISS will apply in its subsequent qualitative review of an executive compensation program. Clearly, it will take some time to understand the overall impact of the test on the quantitative screen and to assess how ISS’ selection, ranking, and weighting of the various financial metrics will affect the outcome for companies of different sizes and stage of development. It’s also worth noting that ISS expressly states that its selection and ranking of the various financial metrics used in the FPA test should not be viewed as an endorsement of their preferred use by companies when determining the performance measures for their long-term incentive plans. Again, it’s unclear whether this disclaimer will actually work. As we know from experience, ISS’ historical use of total shareholder return as the sole financial metric in its pay-for-performance methodology is often cited as the catalyst for today’s widespread use of TSR in performance share and other performance-based long-term incentive compensation plans. The same may eventually prove to be true as a result of introduction of the FPA test. Perhaps more importantly, the FPA test increases the risk of a “pay-for-performance” disconnect for companies that straddle the line between a “low” or “medium” level of concern. As we have previously noted, several of the FPA financial metric rankings are at odds with the financial metrics that many technology and life sciences companies use in their incentive compensation plans. For example, numerous small, mid, and large-cap technology and life sciences companies use top-line metrics such as revenue, bookings, and TSR in their incentive plans consistent with their growth profiles and business strategy. These metrics are, in our experience, almost entirely ignored in the choice of metrics for the technology and life sciences sectors. Conversely, in our experience, ISS’ favored metrics (ROIC, ROE, and ROA) are not commonly used by technology companies. Thus, it is important to remember that, in any given year, ISS’ view on the relative importance of these metrics may not match a Board of Directors’ long-term objectives for its executive team, creating obvious potential for a disconnect. For a more detailed discussion of the FPA, see ISS’ White Paper on its quantitative and qualitative approach to evaluating executive compensation programs, Pay-for-Performance Mechanics. Expanding its focus on non-employee director compensation, ISS has adopted a policy providing that it will recommend a vote against the members of the Board committee responsible for setting and/or approving non-employee director compensation if there is a pattern (that is, two or more years) of awarding “excessive” non-employee director compensation without disclosing a compelling rationale or other mitigating factors for such compensation. For purposes of this policy, ISS will compare individual non-employee director compensation totals to the median of all non-employee directors at the companies in the same index and industry. Observations. While this new policy will not impact vote recommendations in 2018, going forward unfavorable vote recommendations will be issued where a pattern of excessive non-employee director compensation is identified in consecutive years. Notably, ISS has indicated that director compensation levels in 2017, as disclosed in companies’ 2018 proxy statements, will serve as the initial year for identifying a pattern of excessive pay. Although ISS has indicated that the new policy will have minimal impact for most Boards of Directors as it is intended to identify “extreme outliers” (which ISS asserts historically have represented pay figures above the top 5% of all comparable directors), we expect that most Boards will be sensitive to the enhanced monitoring in this area when making decisions about their own compensation. Where a company believes that one or more of its non-employee director compensation levels may be subject to ISS scrutiny, it will be necessary to provide disclosure in its proxy statement explaining the rationale for, or any mitigating factors that contributed to, the unusual pay amount. Where a company has received less than 70% support of the votes cast on its Say-on-Pay proposal, in the following year ISS will conduct a heightened qualitative analysis of the compensation committee’s responsiveness to this shareholder opposition. (In a few instances, we’ve even seen ISS perform a heightened analysis where a company received more than 70% support.) Where such responsiveness is deemed inadequate, generally ISS will recommend a vote against the subsequent Say-on-Pay proposal and potentially the incumbent compensation committee members. whether the Say-on-Pay proposal received less than 50% support (which will warrant the highest degree of responsiveness). ISS goes on to note that where the Board of Directors has demonstrated a “moderate degree of responsiveness,” its unfavorable vote recommendation may be limited to the Say-on-Pay proposal. On the other hand, where a company has multiple years of insufficient responsiveness to shareholder concerns, ISS is likely to view this as a systemic problem about Board stewardship and oversight and may recommend against the full Board. This enhanced policy is likely to compel every company that registers significant opposition to its Say-on-Pay proposal to conduct an active shareholder engagement campaign and to be more forthcoming about this activity in its proxy statement. Ultimately, companies may need to be sensitive to what ISS considers to be an “adequate” response to specific shareholder feedback when drafting their disclosure as its voting recommendation can fluctuate based on its view as to nature and duration of the issues raised by shareholders. Consistent with the introduction during the 2018 proxy season of CEO pay ratios in companies’ proxy statements, ISS will display in its research reports both the annual total compensation disclosed for the median employee as well as the CEO pay ratio. For this initial year of compliance, the CEO pay ratio will not affect ISS’ voting recommendations. As expected, ISS has indicated that it will assess the CEO pay ratio data as it becomes available and, in all likelihood, take into consideration the views of its clients as to the utility and application of this new information. Passing Score – The passing score for Standard & Poor’s 500 companies has been increased from 53 to 55 points. For all other companies, the passing score remains 53 points. We note that ISS has adjusted the maximum scores available under the “Plan Features” and “Grant Practices” pillars of the methodology for Standard & Poor’s 500 and Russell 3000 companies slightly. Treatment of Stock Option Repricing Provision – ISS has clarified the type of provisions that will typically be considered a “repricing” provision triggering an automatic “against” recommendation for an equity incentive plan proposal. These provisions are: the direct exercise price reduction of outstanding stock options; the cancellation of outstanding stock options in exchange for the grant of new stock options with a lower exercise price; the cancellation of “underwater” options in exchange for stock awards; or cash buyouts of “underwater” options. Change in Control Vesting – The change in control vesting factor has been updated so that companies will earn full points only if their equity plan provides that, in the case of performance-based awards, acceleration is limited to actual performance achieved, pro-rata of target based on the elapsed proportion of the performance period, or a combination of both actual and pro-rata, or the awards are forfeited or terminated upon a change in control, and, in the case of time-based awards, acceleration cannot be automatic single-trigger or discretionary. In addition, it is our understanding that a provision calling for full acceleration of vesting where equity awards are neither assumed nor substituted for by an acquiring entity will still enable a company to otherwise potentially earn full points under this factor. In all other cases, no points will be earned. Holding Period Requirement – The holding requirement factor has been updated so that companies can earn full points for having a stock holding requirement for shares acquired from equity awards of at least 12 months (down from 36 months). If the holding period is less than 12 months, no points will be earned for a holding period requirement that applies only until stock ownership guidelines are met. CEO Equity Vesting – The CEO vesting requirement factors (for both time-based and performance-based equity awards) have been updated so that companies can earn full points if the vesting period is at least three years from the grant date until all shares vest. No points will be earned for a vesting period requirement of less than three years. Discretionary Equity Vesting – The discretionary accelerated vesting factor has been updated so that companies can earn full points only when discretion is limited to cases of death and disability. No points will be earned for the ability to exercise discretion in any other situation (including a change in control). Minimum Vesting Requirement – The minimum vesting factor for equity awards has been updated to formally clarify that a ratable vesting schedule allowing for partial vesting before the end of the one year period will result in no points being earned. ISS has clarified that it may issue an “against” recommendation for a proposal amending an equity incentive plan even though the plan receives a passing Equity Plan Scorecard score, if the proposed amendments as a whole represent a substantial diminishment to shareholders’ interests. On the other hand, ISS may support a proposal despite a non-passing score, if the proposed amendments, as a whole, represent a substantial enhancement to shareholders’ interests. Observations. ISS continues to tweak its Equity Plan Scorecard methodology, gradually tightening and, this year, attempting to simplify the requirements to build a passing score for an equity incentive plan proposal. While this year’s changes are innocuous on their face, they represent a growing homogenization of equity plans as companies design such plans to ensure that they receive a favorable ISS vote recommendation. This year’s changes, which also include the elimination of the option of earning a half-point for plan features that don’t quite satisfy ISS’ preferred design, further advance the “all-or-nothing” nature of the process and are likely to continue to reduce the size of ISS-compliant share requests over time. Each year, ISS updates its burn rate tables and stated benchmarks for S&P 500, Russell 3000 (excluding the S&P 500), and non-Russell 3000 companies for the upcoming proxy season. Generally, ISS measures “burn rate” using the total number of equity awards (full value stock awards and stock options) granted in a given year and expresses the computation as a percentage of the number of common shares outstanding. These tables set ISS’ burn rate benchmarks (based on one standard deviation above the industry mean) using Standard & Poor’s global industry classification standard (“GICS”) codes as assigned to each company. ISS’ updated 2018 burn rate tables, which apply to annual meetings of shareholders held on or after February 1, 2018, are set forth in the Exhibit to this article. The burn rate benchmark is primarily used by ISS as part of its Equity Plan Scorecard evaluations. The specific benchmark for each industry sector is a point in the middle of the sliding scale. Full credit is given to companies with burn rates at 50% of the burn rate benchmark or less. Companies with burn rates above the burn rate benchmark will earn partial credit on a sliding scale (up to a limit of 150% of the burn rate benchmark). Thus, in many instances companies may still receive some credit for burn rates above the applicable benchmark. Observations. 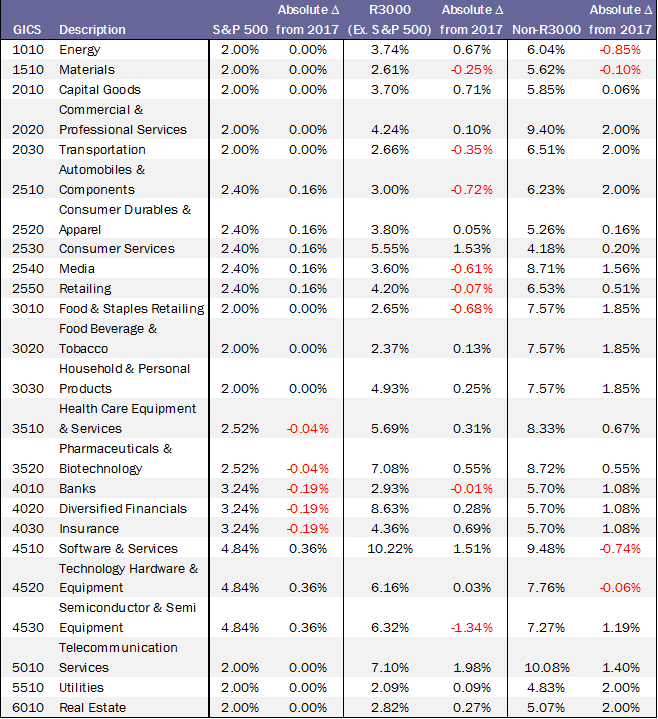 While ISS’ burn rate methodology remains the same as in 2017, the 2018 burn rate benchmarks for key technology and life science industry sectors are generally higher by up to 0.3% to 0.7%, with a couple of notable exceptions – the benchmark for the Russell 3000 Semiconductor & Semiconductor Equipment sector is down significantly by 1.34% to 6.32% and for the non-Russell 3000 Software & Services sector is down 0.74% to 9.48%. The benchmark for the Russell 3000 Software & Services sector went up significantly by 1.51% to 10.22%. Companies should consider these updated benchmarks as one factor in their annual equity strategy review. Companies that developed equity budgets for 2018 with consideration of the then-current 2017 limits may have more or less flexibility with their equity programs than originally anticipated (depending on program goals, equity plan funding, competitive needs, etc.). See our Thoughtful Pay Alert, The New ISS Pay-for-Performance Methodology – A Closer Look at the Gathering Storm (June 12, 2017).